1846 (Apr. 2) Leige, Belgium to New Orleans, La., folded cover with red Liege (4.2) cds and manuscript "24" prepaid rating on back, red "PD" framed handstamps and manuscript "1/8" 1s8d credit to G.B., red London Paid (4.4) and black Liverpool (4.4) transits, carried by Cunard Line Caledonia from Liverpool Apr. 4th to Boston arriving Apr. 20th, New Orleans large blue "12" due handstamp, Very Fine, ex-Winter. The 24 decimes prepayment included 4 decimes Belgium internal, 8 decimes British and 12 decimes transatlantic fees, of which 20 decimes or 1s8d was owed to G.B. 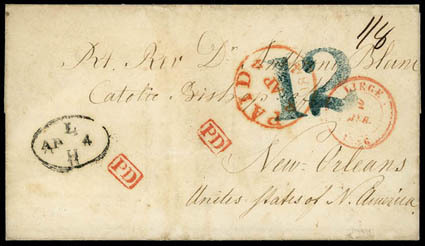 Letter not rated at arrival port of Boston, but in New Orleans where large blue "12" was applied for the postage due (2¢ ship plus 10¢ U.S. inland fees). 1847 (Jan. 13) Havre, France to Kingston, Mass., datelined blue folded letter with blue "Forwarded by / Yours respectfully / Havre '14 Jan '47' Wm. Slade" three-line forwarder's handstamp, red London Paid (1.19) Maltese cross and matching "Paid Ship Letter, London, 19 IA 19, 1847" crown rimless oval with red "8" pence prepaid rating, carried by Sands & Co. Sarah Sands from Liverpool from Jan. 20th to New York arriving Feb. 10th, red "New-York, Ship, 7 cts, Feb 11" integral due cds, Very Fine. A RARE USE CARRIED ON THE MAIDEN VOYAGE OF PIONEER STEAMSHIP "SARAH SANDS". The "Sarah Sands" of 1,400 tons was built for Sands & Company of Liverpool by James Hudson & Company, also of Liverpool as an iron screw propelled vessel and launched in September 1846. The maiden voyage from Liverpool to New York left on the 20th January 1847 and the Prices Current shown below traveled on that voyage. 1847 (Jun. 1) New York, N.Y. to London, England, folded letter with red "New York Jun 1" cds with matching arced "Paid" handstamp, endorsed "per Washington", carried by Ocean Line Washington from New York Jun. 1st to Southampton arriving Jun. 15th, red "London 16 JU 1847" arrival backstamp and manuscript "1/" shilling discriminatory due rating, Very Fine, ex-Winter. A RARE LETTER CARRIED ON THE INAUGURAL VOYAGE OF AMERICAN TRANSATLANTIC PACKET SERVICE. The commencement of the American Packet service led to Britain imposing a "Discriminatory Rate" on mails landed at Southampton with all US prepayment ignored and the One Shilling Packet Rate charged to the addressee. There are four recorded examples to Great Britain, each showing the discriminatory fee. There are also three recorded covers on this voyage to France and Germany. 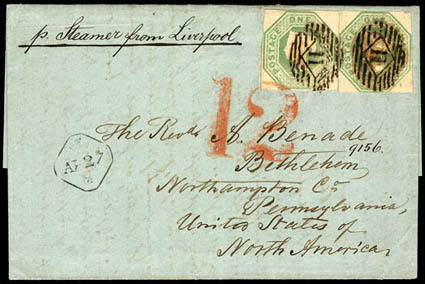 1847 (Aug. 28) Bad Eams, Germany to Baltimore, Md., blue folded letter with "Bad-Ems/ 28 Aug 1847" two-line postmark with red manuscript "fr 10" rating and oval "P." handstamp to the care of London forwarder, red London (8.31) arrival cds, reverse with "Forwarded by Frurling & Goschen, London" oval handstamp, reposted with red London Paid (9.3) Maltese cross datestamp and red manuscript "1/-" shilling prepaid packet rating, carried as endorsed by Cunard Line Britannia from Liverpool Sep. 4th to Boston arriving Sep. 19th, closed bag to Baltimore where blue "12" due rating handstamp struck for 10¢ inland postage plus 2¢ ship fee, Very Fine. 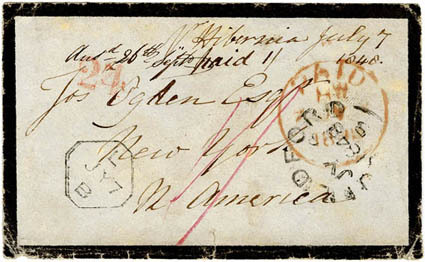 1847 (Dec. 3) London, England to New York, N.Y., Turned and Reused back to London, cover with red "Guilford St." straightline on flap, red London (12.3) and "Paid 1/-" shilling prepaid rating, carried by Cunard Line Hibernia from Liverpool Dec. 4th to Boston arriving Dec. 25th, New York red "7" cents due handstamp, sender turned and resent on return trip of the Hibernia from New York Jan. 2nd to Liverpool arriving Jan. 16th, London (1.17) backstamp with manuscript "1/-" due rating, small opening tear, otherwise Very Fine, This is the first recorded turned transatlantic cover crossing the ocean twice on the same vessel., ex-Winter. 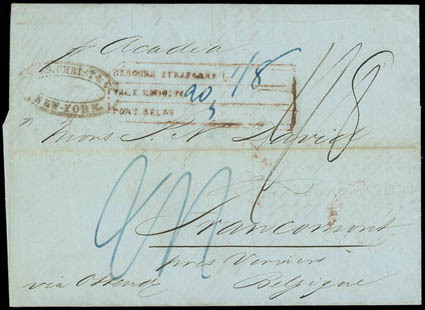 1848 (May 1) New York, N.Y. to Francomont, Belgium, blue datelined folded letter endorsed "via Ostend", carried as endorsed by Cunard Line Acadia from Boston May 3rd to Liverpool arriving May 16th, red London (5.17) backstamp transit and manuscript "1/8" debit rating, red Ostend transit backstamp and matching Belgian framed accountancy handstamp, F.-V.F. 1848 (Mar. 15) Elizabethtown, Ind. 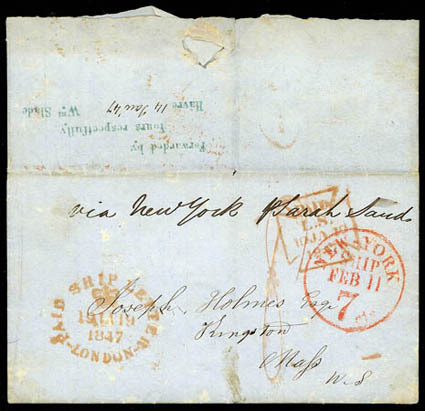 to Ochsenbach, Württemberg, folded letter with manuscript "Elizabeth Town, March 15" postmark and "Paid 10" rating, "New-York Mar 20" backstamp, carried by Ocean Line Hermann from New York on Mar. 21st to Bremerhaven arriving Apr. 13th, many manuscript postal ratings, handstamped "America / uber Bremen" with red crayon "¾" transit fee rating, Very Fine, ex-Winter. 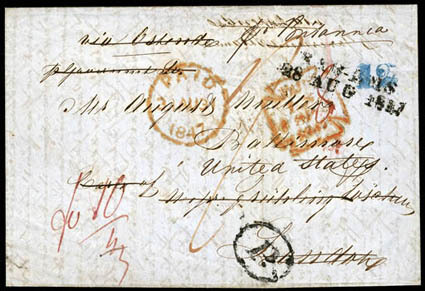 A SCARCE LETTER CARRIED ON THE FIRST OF FIVE VOYAGES UNDER THE BREMEN POSTAL TREATY OF 1847 SHOWING THE ¾ GGR. FEE. 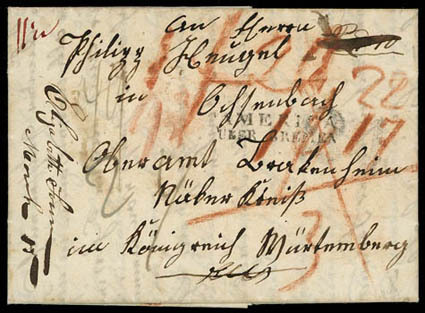 Letter sent to Oberamt of Brackenheim since there was no post office in Ochsenbach. On first five voyages of Ocean Line to Bremerhaven, Bremen charged ¾ ggr. for transit from Bremerhaven to Bremen. Bremen debited Hannover 9¾ ggr. Hannover debited Thurn & Taxis Post 11 1/12 ggr. (equivalent to 49 kr.). Thurn & Taxis Post added 24 kr. transit but debited Württemberg 77 kr. instead of 73 kr., or 1 fl. 17 kr. Württemberg added 3 kr. and Oberamt added 2 kr. for total postage due of 1 fl. 22 kr. Less than 20 covers have been recorded showing the ¾ ggr. transit fee. 1848 (Apr. 21) Bertlesdorf, Holland to Bethlehem, Pa., blue folded letter with "W. Mallalieu & Co., London, Apr. 26, 1848" forwarder's handstamp on reverse and bearing two G.B. 1s green, embossed (5) singles, cancelled by sharp "11" oval grids, London (4.26) backstamp, Liverpool (4.27) transit, carried by Cunard Line Cambria from Liverpool Apr. 29th to New York arriving May 14th, New York large red "12" cent due rating handstamp ties left stamp, Very Fine and choice. The Anglo-American postal conventions provided a reliable mail route to America. This cover was handled by London forwarder W. Mallalieu & Co. who posted at double the 1s transatlantic packet fee prepaid with G.B. 1s green embossed issue. New York rated 12¢ due for double the 5¢ letter rate under 500 miles plus 2¢ ship fee. (Retaliatory Rates) 1848 (Jun. 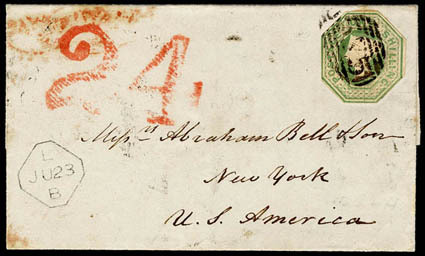 22) Belfast, Ireland to New York, N.Y., folded cover with "Norwich, JU 22 1848" double-arc backstamp and matching "575" barred oval ties cut-to-shape G.B. 1s green embossed (5), Liverpool (6.23) octagon transit, carried by Cunard Line Caledonia from Liverpool Jun. 24 to New York arriving Jul. 8, New York large red "24" retaliatory due handstamp for the American packet rate, Very Fine. ONE OF ONLY THREE RECORDED EXAMPLES OF THIS LARGE NEW YORK "24" RETALIATORY DUE HANDSTAMP. 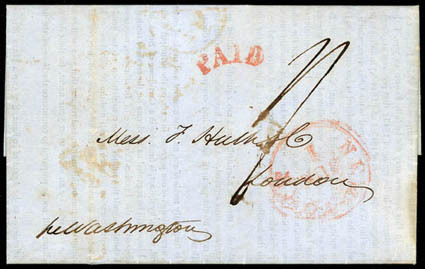 Letter carried on 1st of 25 Cunard mail voyages to the U.S. under the retaliatory order by which the U.S. charged the American Packet rate on letters carried to or from the U.S. by British contract mail steamers. The result was a double charge for sea postage since the British insisted on charging their own sea postage. (Retaliatory Rates) 1848 (Jul. 6) Guilford, England to London, England, mourning cover with "Guilford, JY 6, 1848" single-arc datestamp and red manuscript "1/-" prepaid rating, red London Paid (7.7) cds and Liverpool (7.7) transits, carried as endorsed by Cunard Line Hibernia from Liverpool Jul. 8th to New York arriving Jul. 21st, New York red "24" cent due rating handstamp; edge wear and small faults, Fine, One of the earliest recorded example of the scarce New York small "24" retaliatory rating handstamp.